From Vertigo: From the mind of New York Times #1 bestselling author Neil Gaiman comes a new world filled with dreams, nightmares and wonderful characters living together in a shared universe for a new story unlike anything we’ve ever seen before. As we round the corner to the 30th Anniversary of Neil Gaiman’s ethereal world, we are show more of the dark corners. Kicking off with this book – it will be continued with 4 new series: The Dreaming, Books of Magic, House Of Whispers and Lucifer. As a result, you will see some interesting new viewpoints that readers have been experiencing since Neil introduced Dream way back in ’88. It’s hard to review a book that has six writers and five artists. It’s a flurry of activity. As well – it’s a smorgasbord of the creators that will be working all the new books. However, I found the art was well suited to the story regardless of the artist. To say its a beautiful book is an understatement. And a Jae Lee cover to top it all of… it’s way over the top. And that’s really what Mr. Gaiman’s books require since the stories are super layered and multi-faceted. I’m going to focus on the story rather than the story-telling here. With each new writer, there is a slight variation but nothing too big to worry about – they work as a team. However, the story is very much a Sandman-style story. I have a confession here: I just read the original Sandman for the first time before reading this book. Man – was I missing out. However, new readers need not worry about having to go back to the beginning. This story stands on its own. What truly bothers me is that I can’t summarize the story here without giving away the juice. And there’s a lot of juice here! It’s not much to pick up this #1. 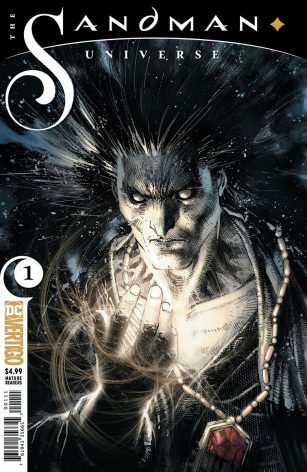 If you’re new to Sandman – it’ll give you a taste of the series and maybe hook you. If you’re a Dream veteran – well – you’ve already had this on your pull-list for weeks. So why do you need me? Side Note: Doctor Who fans – if you enjoy this book – Neil Gaiman has written two episodes of the Doctor: “The Doctor’s Wife” in 2011 and “Nightmare In Silver” in 2013. Widely considered some of the best writing in television.